This week, we're tackling A One Room Adventure, another contest winner from The Rainbow Book of Adventures. This BASIC-language adventure was written in 1982 by Jorge Mir (who also wrote Dreamer) and published in early 1983, tackling a theme more commonly in recent interactive fiction -- an entire adventure that takes place in a single room. 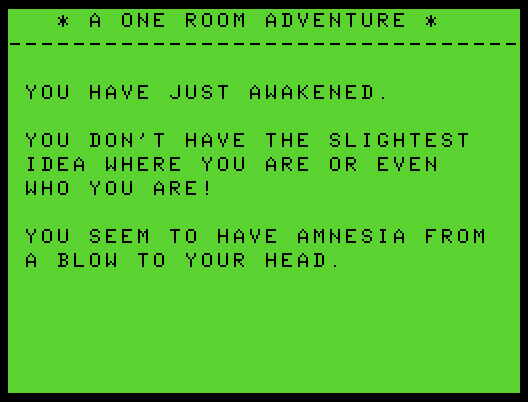 The premise briefly summed up on the title screen is more explicit about the traditional adventurer's amnesia than the norm; our mission, of course, is to figure out what's going on and escape the room. We start in the middle of a room, sitting on a chair, blindfolded. We have nothing in inventory. I try to ROCK CHAIR -- SORRY, I JUST DON'T KNOW HOW TO ROCK ANYTHING. Trying to REMOVE BLINDFOLD reveals that, as we might have guessed, MY HANDS ARE TIED WITH A ROPE. Even so, with a FEEL BLINDFOLD we somehow manage to not feel anything unusual, and we can't WIGGLE EYEBROWS to loosen it. I try to RUB HANDS to loosen the rope, and receive an unexpected prompt -- ON WHAT? I try ROPE, but NOTHING HAPPENED. I try to LEAN OVER, but I DON'T HAVE IT? GET UP suggests that I CAN'T GET ANYTHING NOW!, and STAND UP indicates that we don't know how to stand anything. How about SHAKE HEAD? I DON'T HAVE IT TO SHAKE. EXAMINE HEAD yields DID ANYBODY MENTION ANYTHING ABOUT ANY HEAD? So this is one of those parsers that tries to look smarter than it is, by tossing any unrecognized words into a generic handler instead of confessing its dictionary's ignorance. We can't JUMP or TIP or CHEW or EXAMINE anything, or RUB anything on anything else as far as I can tell, though EXAMINE and RUB seem limited due to the blindfold and not the parser. So maybe we should work on removing that first. I try lots of unrecognized phrases, to no avail, and finally I ask for HELP. This game actually has a help system that accepts objects (BLINDFOLD in this case) and responds with hints, and it lets me know I'm on the wrong track -- we need to work on freeing our hands first. I can't STRETCH ROPE, or SPREAD HANDS, or CLASP HANDS, or RUB HANDS on HANDS, or MAKE FIST, or SLIP HANDS, or SLIP ROPE, or LOOSEN ROPE. I try to FEEL POCKET, FEEL PANTS, EXAMINE POCKET -- this, at least, revealing that I DON'T HAVE ANY POCKETS -- and FEEL CHAIR... aha! I FEEL SOMETHING LIKE A NAIL. Aha! RUB ROPE on NAIL tears the rope. Now we can UNTIE HANDS, UNTIE BLINDFOLD, and see that we are facing the room's north wall. We see a chair, a desk, and a radio here, and the north wall specification is important -- there are actually four locations within this room that we can visit. The east wall is near a toolbox, a couch, a big bird cage, and a wood burning stove; the south wall adjoins a door, and we see a switch on the wall, a picture, and a flower pot; and the west wall provides access to a window, some antique furniture, a coat rack, and a coat on the rack. Most or all of these items will probably be needed if we are going to escape the room, presumably via the door or the window. Of course, we can't just OPEN the DOOR or the WINDOW. There are sunflowers growing in the flower pot, and the picture depicts a boat, in a nice wooden frame. There is, of course, a vault revealed if we GET PICTURE, and opening it will require a combination. The antique furniture near the west wall turns out to be a bookcase, containing a single notable item peculiar to the era in which this game was written -- IT'S A BOOK ON CB RADIOS. So the radio must be one of those 1970s relics of Convoy fame. The book tells us we need power, an antenna, and a microphone to operate the CB set. The sports coat on the rack can be taken and examined -- EXAMINE POCKET here yields a pair of pliers, generally useful in adventure games. After we're done checking it out, we can try to PUT COAT - WHERE? - ON RACK - PLEASE, ANSWER WITH ONE WORD - WHERE? - RACK -- but after all that discussion, I CAN'T. Good thing, though, as if I had I might have missed the wire hanger remaining on the rack -- although my attempts to BEND HANGER and MAKE ANTENNA don't pan out. Returning to the north wall, we'll check out the desk, which has a large drawer on the side -- locked, naturally. Near the east wall, some closer examination establishes that the toolbox is rusted shut, the cage contains a white dove, the couch contains some pillows, and the stove is one of those pot-bellied Franklin stoves. We can OPEN STOVE to find an electric cord, good. The pillow seems heavy, but we need something to cut it with. The chair is described as FRAGILE, but the pliers and toolbox are insufficiently heavy to BREAK CHAIR and so is the heavy pillow. There's a can opener on the couch, now that we've moved the pillow, and at last we've hit the inventory limit -- 8 items, though as the map is so constrained this shouldn't be a big problem. The birdcage is wired shut, but we can CUT WIRES - WITH WHAT? - PLIERS, then OPEN CAGE to release the dove. All this establishes is that the cage is now empty, and it's A SPECIAL TYPE DOVE. A carrier bird, maybe? Can we attach the cord to the radio? One end is bare and the other end has a plug, but I fail in my attempts to ATTACH CORD and FIX RADIO and USE CORD. Somehow, something I've done (maybe picking up the can opener -- yes, that's it) allows me to OPEN TOOLBOX now, yielding a crowbar, screwdriver, and hammer. Even the crowbar and hammer seem unable to break the fragile chair, though. We can TAKE SUNFLOWERS from the pot, and observe that THEY ARE KIND OF DRY. We don't have any water, but SHAKE SUNFLOWER loosens some seeds, which fall to the floor, attracting a mouse who eats them and flees. Hmmmm. This seems like a problem to solve, but I fail in my attempts to somehow shake the seeds into the bird cage in hopes of catching the critter. Can we move any of the furniture? The couch won't budge, but moving the desk reveals an electric outlet. And I luck into the right verbiage -- we can CONNECT CORD - WHERE? - RADIO and then CONNECT CORD - WHERE? - OUTLET to successfully power the radio. That helps me figure out that we can CONNECT HANGER - WHERE? - RADIO to create a makeshift antenna as well. So we just need a microphone now, and we'll pause to take advantage of the game's SAVE command, rare in these magazine type-in adventures -- it even handles both cassette and disk saving. What else can we try? Experimentation establishes that the parser recognizes UNSCREW but not SCREW, so we must need the screwdriver for removal rather than assembly. We can BREAK WINDOW with the crowbar, and the dove flies away. That might be premature, so I'll re-LOAD my recent save. I try to EXAMINE FLOOR and notice a small rug and some wire there, along with a familiar blindfold and piece of rope. MOVE RUG reveals a loose floorboard, as it so often does in these games, and we can... well... EXAMINE BOARD suggests that IT SEEMS TO GIVE A LITTLE, but we can't PULL BOARD at all and can't PUSH BOARD "WITH JUST MY HANDS." Having the crowbar in hand makes a difference, revealing a round box... but it's empty, and proves unsuitable for catching falling sunflower seeds. There's a common bug here -- every time we PUSH BOARD, the round box re-materializes under the floorboard, and if it's in our hands the removal isn't counted correctly and we lose an inventory slot. I'm down to seven usable slots now, and hoping that doesn't break the game. Since the floor proved productive, it's not a bad idea to LOOK CEILING -- where we see the dove flying around and nothing else of note. It seems like it might be a good time to ask for HELP about the RADIO -- and we're encouraged to PLAY RADIO. We tune in just in time to hear a local news report about a truck stop robbery and a missing driver, presumed kidnapped... it definitely sounds like we may be that person. 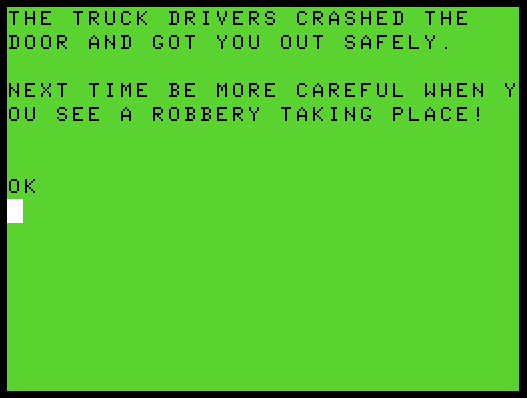 We're told that lots of our truck driver friends are driving around looking for us, so there's hope! So maybe we should break the window, let the dove fly and see what happens. This also has the effect of adding some glass to the mess on the floor, with which we can CUT PILLOW to reveal a magnifying lens. Hmmmm... it's a SHERLOCK HOLMES OFFICIAL FAN CLUB LENS. So we should be able to do some detecting with it. Can we do anything else with the sunflowers and the mouse? It's not clear that we can see a mouse hole anywhere at all, but if we try to LOOK HOLE we observe that it LOOKS LIKE IT WAS MADE BY A LARGE RAT. Can we block it? The pillow and the rug don't seem to work, nor does the sport coat. Ahhhh.. the round box is round for a reason, and PUT BOX - WHERE? - HOLE plugs up the rodent traffic, so now we can SHAKE SUNFLOWER and GET SEEDS. While we're doing this, we see that SOMETHING JUST CAME THROUGH THE BROKEN WINDOW, the returning dove it appears, and with the seeds in hand, we can GET BIRD. But is there a message? EXAMINE DOVE doesn't note anything new, and we can't FEEL anything unusual about the bird. HELP suggests we let it fly away, so let's try that again; it flies through the open window once more. It won't come to us unless we have some sunflower seeds, which it eats upon arrival, but it doesn't seem to be bringing us any messages, so we must need to arrange an outgoing note. Can we UNSCREW anything at all? Not that I can find. How about OPEN? We can OPEN RADIO to pop a battery out onto the floor -- shouldn't need that with the power cord connected, though... hmmm... it seems we do? We'll have to figure that out later. I try dropping the dove again, and this time it returns with a piece of paper bearing the combination 4R8L12R. (I did some after-game checking -- the dove only works as expected if we shake out and retrieve another batch of seeds while we have the bird in hand, then drop the bird; it flies away, then immediately returns with the paper tied to its leg, whereas if we don't have seeds when we set it free, it will come back when we get some but without the paper.) There's no fancy parser wrestling here -- we can now try to OPEN VAULT, respond to the combination prompt with the exact string specified, and obtain a set of keys! Now we can OPEN DESK and EXAMINE DRAWER to reveal a CB SET! So I've been wrestling with the wrong radio entirely. The CB already has a microphone attached, with a button on it upon closer examination. But nothing happens when we PUSH BUTTON? Oh, I have to connect the cord and the hanger to the CB rig like I did the radio earlier. Still nothing? Can we TURN CB ON? I TRIED, BUT NOTHING HAPPENED. There seem to be several bugs at large here -- I had to dig into the code to see that if we've connected the cord to the radio previously, its description changes to IT'S PLUGGED IN and breaks the logic here, so the CB description never changes as we get it into working order. The big hiccup is that the CB RIG has to be visible in the room in order for it to work at this point, and EXAMINE DRAWER reveals its existence without making it visible the way the code wants it to be. Closer examination of the internal logic reveals that we have to GET CB out of the drawer before we can actually use it! This oversight is a bit annoying, because we can do just about everything else -- we can see the CB in the unlocked drawer, connect the cord and the antenna, turn on the power using the switch on the south wall, and see the microphone and its button without touching the rig at all. But we can't actually PUSH BUTTON to talk until we GET CB and drag it into inventory and either keep it or DROP it into a visible location. It's one of those cases where what works for the designer doesn't necessarily work for a larger audience that may not behave exactly as the code anticipates. A One Room Adventure is fairly challenging within its narrow scope, with logical puzzles marred only by strange behavior around the more complex situations. Without access to the source code I would have been pretty stuck, but I managed to push on through and enjoyed the journey despite a few headaches along the way. This one hasn't aged well, but it still provided a few interesting hours of adventuring. Even "Pick Up The Phone Booth And Die!" was a 2-room adventure, at least. 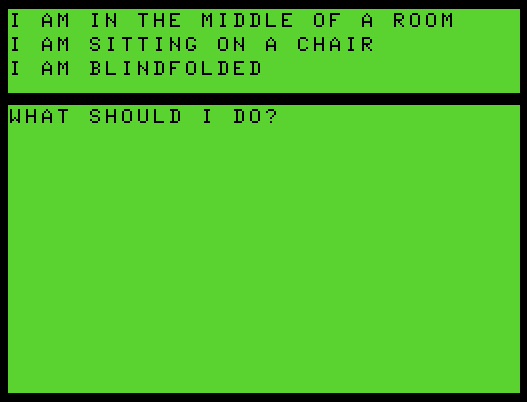 Hm, now I'm wondering whether anyone's tried to convert Jason Shiga's FLEEP to a text adventure. And since language plays such a part of that story I also wonder whether any text adventure's have tried to cover up the parser's limitations with "Excuse, but my English...she is not so good. Could you say it elseways please?" With a few different replies it might not be as annoying as the ELIZA-like attempts at custom responses. "Uh-huh, yep. Sure! I'm nodding my head like I understood what you said."